Ning Shu looked at her soul again. If she entered the world when her soul was this dim, she would definitely be influenced by the original host’s strong emotions again. It was best not to try to run until one could walk. Ning Shu decided to first meditate for a while. She sat down and started absorbing the things in the system space in order to strengthen her soul. This was undoubtedly a very slow process, but it was the only option she had. What she wanted the most right now was to obtain a cultivation manual that could strengthen the soul. How long did she have to wait until she could become an official player? There was no concept of time in the system space. Ning Shu sat on the ground without moving. After an unknown period passed, Ning Shu opened her eyes and looked down at her body. She felt that her soul had solidified a little more. When she touched it, it felt like touching milk. It was a satiny sensation. “System, are you there? I want to start the task.” Ning Shu lifted her head and asked while looking at the wall in front of her. She had no idea where the system was. Right after she spoke, she felt suffocated. Frick, couldn’t they give her time to prepare first? At the very least she should have been given a quick notification. In the heavy darkness, she could sense that there was someone beside her and talking to her. With great difficulty, she opened her eyes. Her head felt very heavy and she couldn’t move at all as she looked at the bed canopy above her. Her mind was blank. When the servant girl next to the bed saw that she had woken up, she seemed extremely moved and immediately knelt next to the bed and cried, “Princess, you’re awake!” Then she hastily sent someone to get the imperial physician. Ning Shu turned her head and looked at the maid that was kneeling next to the bed. 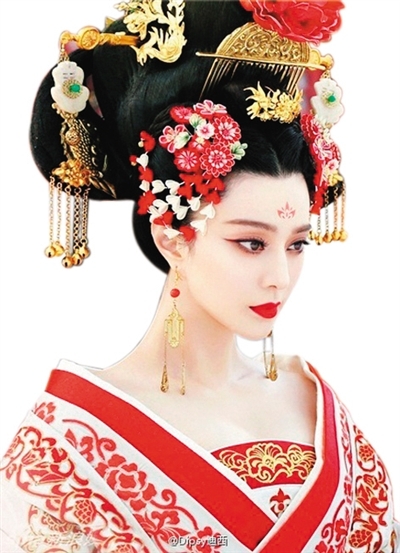 Her hair was combed up into an elegant hairstyle with a bead flower as an ornament. She was wearing lily magnolia double embroidered satin garments that had a layer of gauze fabric draped over it. The soft swell of her breasts could faintly be seen. Ning Shu’s body felt very heavy and her stomach was completely empty. She didn’t even have the strength to lift her hand. That maid wiped off her tears. When she heard that Ning Shu wanted to eat, tears of joy spilled down her face again. She lifted the hems of her garments and ran out of the palace. Ning Shu lay on the bed, starved to the point she felt dizzy. How long had this body been starved? Was this the path of starving to death? Her brain felt both chaotic and blank. She decided to wait until after eating to receive the storyline. The girl earlier had called her princess. From the looks of it, this body had a very high status. She had never imagined that there would be a day she could experience the fantasy of being a little princess. Not long later, that girl returned with a bowl of congee. It was simmered with meat stock and vegetables until they turned soft. The moment Ning Shu smelled this fragrance, her stomach started growling. Ning Shu nodded and joy immediately lit up the maid’s face. She spooned a small mouthful and blew on it before feeding it to Ning Shu. It was unknown how long this body had been starving, as even this mild congee caused the stomach a bit of pain. Luckily, her body slowly adjusted. Ning Shu only ate one bowl before stopping. The maid helped Ning Shu lay back down. Ning Shu looked at the maid. She seemed only about fifteen and was quite delicate and pretty. However, Ning Shu’s gaze was focused on this girl’s chest. This era’s clothing was still rather open and sensual. It was like the clothing of the Tang dynasty. It covered the chest from the front but if one looked down from above, the cleavage within was in full view. Ning Shu saw that this girl treated this body rather well. Not only was she respectful, she also seemed very concerned. Ning Shu hadn’t received the storyline yet so she still didn’t know what this girl’s character was truly like. However, based on this girl’s earlier behavior, she probably had a pretty good personality. Right after Ning Shu lay down, another maid ran into the palace. Probably due to the fact that she had rushed here, her face was bright red and there was a bit of sweat visible on her delicate nose. #comment: Ning Shu’s pretty dirty-minded… Her innocence only lasted like 1 chapter. Must have been exploring a lot of media while she was in the hospital. Well, yeah, I’m sure ultimately Ning Shu will solve the problem and everything will work out. That’s the sort of novel this is, after all. It’s just the lack of care and foresight bother’s me a little. When finding oneself in a new unknown situation information gathering should be top priority. Especially when the setting seems at odds with itself, like this one (wealthy, cherished princess with food on demand yet starving) lest you screw up and make the situation worse. Like what if the scenario is <> and the hunger strike has been making the parents nervous and slowing down the proceedings. But now Ning Shu is here and doesn’t know the situation so she eats a bowl of porridge, the parents heave a sigh of relief and now the weddings been moved a half year forward so their silly daughter doesn’t get the chance to try anything else foolish. And when Ning Shu goes to talk things they treat her like a simpleton, after all her little strike didn’t last three days, with such little will power how could she know what’s best for her? I don’t really know she screwed herself over or anything, and I’m sure it’ll be a fun read even if she did. But if the scenario is going to be difficult I’d like it to be because her enemies were competent, not because, Ning Shu has a lower INT than she has luck. I say, Ning Shu, you know that anyone who you inhabit is in some sort of dire straight and cornered to the point of gambling there soul on you making it better. Further you immediately deduced you were inhabiting a princess who could eat at any time, demonstrated by you receiving food on request, and yet woke up half starved. This means princess was probably, no, certainly hunger striking. Are you sure you want to eat before you find out why?! You know your going to be negotiating from a position of weakness when you confront what ever problem there is after demonstrating such weak resolve, right? Thanks for the chapter. I wonder what the new scenario is. Ooh~ a princess this time~ is it a high rank dificulty this time?